I am sorry to report that despite my efforts, Republican Dan Benishek, a climate-change denier, will be going back to Congress in January. It's a grim prospect particularly given that so many deniers are already in the House. Climate change is the defining issue of our time, and the leading issue of my campaign. Neither of the other candidates took on the issue aggressively. Climate problems will arise not so much for my generation, but will increase incrementally for the next, and for each after that, until the seas overwhelm the US eastern seaboard and low areas around the world. I appreciate deeply the 2608 votes I received, and the work of everyone else who supported my efforts to prevent climate catastrophe. The spiritual US Taxpayers and Natural Law parties did not participate. Greens and Libertarians, together got 2.58%. Libertarian Loel Gnadt scored almost half again as many votes as I, repeating a disparity seen in my last two congressional runs, though the effect was not as pronounced this time. For comparison, in 2012, a presidential year with high voter participation and four candidates running, I got 4171 votes or 1.2%. The two minor parties in total got 4.3%. Republican Dan Benishek won with a plurality not a majority, 48.1%. Democrat Gary McDowell, with 1881 fewer votes, got 47.6%. Interviewed a year before the election this year, Democrat Jerry Cannon, a career military officer, predicted he would do better than McDowell, the Democrat in 2010 and 2012. He noted that unlike McDowell his political experience was local, on the school board and as sheriff of Kalkaska County. He has no voting record on state or national issues, and isn't thought of as a career politician, he noted. He added that the demographics of the district have changed. Most of the population is below the Mackinac Bridge primarily around Traverse City, an area where Cannon is from, and where McDowell did very well compared to Benishek, Cannon said. Actually, he was wrong about the demographics. In 2010 McDowell got 40.9% in a field of six candidates. None of the four counties he won is below the bridge. In 2012 the southern boundary of the district changed. The area north of Bay City along Saginaw Bay was removed, and Traverse City came in. McDowell improved, getting 47.6%, and winning 11 counties. But all but two (Benzie, Manistee) were in the upper peninsula. In other words, McDowell did poorly in the area Cannon says he did well. This year Cannon got overall 2% less than McDowell in 2012, winning only four counties. McDowell won the same ones plus seven more. Cannon lost Kalkaska County where he was sheriff for four terms, Grand Traverse County where he lives now, and one of the counties below the bridge (Benzie) that McDowell won. For myself, my highest percent was in Kalkaska County, and highest vote total was in Grand Traverse County. My high percent counties (over 1%): Antrim, Benzie, Charlevoix, Crawford, Emmet, Grand Traverse, Kalkaska, Keweenaw, Leelanau, Manistee, Montmorency, Oscoda. My high vote total counties (over 100): Antrim, Benzie, Charlevoix, Chippewa, Emmet, Grand Traverse, Leelanau, Marquette. Given my limited budget, campaigning extended to participation in candidate forums in Gaylord and Traverse City, a campaign trip to Marquette, responses to voter-guide questions of the League of Women Voters, MLive, and Detroit free Press, and purchase of newspaper ads in Marquette Mining Journal, Petoskey News-Review, Traverse City Record-Eagle, and Northern Express. I also spent significant time giving people reasons to vote for me, by developing thoughtful positions on important issues. Detailed new pages on the site this year concern global warming, ISIS, single-payer health care, and Guantánamo Bay. I distributed cards to street-level voters in the last three weeks of the campaign. I also had a campaign facebook page. 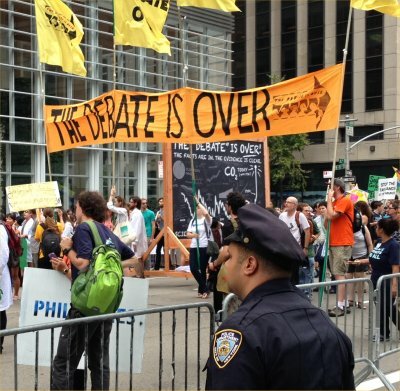 I took time to attend the People's Climate March in New York City on September 21, and speak at two workshops the day before for the Global Climate Convergence. 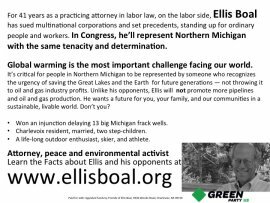 Green Party contender Ellis Boal of Charlevoix, a seasoned lawyer, was included in the forum. Not surprisingly, he stated: “...climate change is the defining issue of our time.” He also did a solid job in dealing with many other issues. Benishek has little to show for two terms in the House except his votes against the Affordable Care Act. Cannon has catch phrases and criticism of Congress but not much else. We can’t endorse either candidate. A surprising campaign sidelight was the armed appearance of US Taxpayers gubernatorial candidate Mark McFarlin speaking at the candidate forum the afternoon of October 1 at Gaylord High School. A holstered pistol was on his side. Benishek and I were there. Legal or not, I didn't like McFarlin bringing it into a high school. Libertarian Loel Gnadt lives 200 miles south of the district, and showed no interest in going to Congress despite his name being on the ballot. Save for a response to one voter guide, that of the League of Women Voters, he did no campaigning. He was invited to participate in the Traverse City forum on October 21 and declined. Libertarians and Greens have little agreement on policy. For example, Gnadt's statement of priorities in the LWV voter guide did not mention climate, nor did his response to the "energy and environment" question. At the Gaylord High School candidate forum in 2012 Libertarian US Senate candidate Scott Boman said global warming was a hoax. According to its Wiki article, Libertarians believe employers should have the right to refuse to recognize any union, which would include even unions with majority support. Unlike many politicians seeking to deny climate change -- who say "I'm not a scientist," -- Republican Dan Benishek says the opposite, that he is "a scientist" and "I believe in peer-reviewed science." Yet he asserts climate change is "baloney." If he really is a scientist he's not a very good one. He doesn't listen to the hundreds of expert peers of the climate science world. Nearly unanimously, they say he is wrong and the consequences of global warming will devastate future generations. It's extremely likely that human influence, primarily the burning of fossil fuels, has been the dominant cause of global warming over the past several decades. Without urgent action to slash greenhouse gas emissions, warming by the end of the 21st century will lead to high to very high risk of severe, widespread, and irreversible impacts globally, such as passing the point of no return for the West Antarctic Ice Sheet to collapse into the sea resulting in a 10-13 foot rise in sea level. Compared to the previous IPCC assessment, the report includes stronger evidence of the many ways the planet is already experiencing the effects of human-caused climate change -- sea-level rise, shrinking glaciers, decreasing snow and ice cover, warmer oceans, and more frequent and intense extreme weather events. Although it's a statement of scientific consensus, the report's 40-page "summary for policymakers" was approved by the policymakers themselves. Scientists and representatives of the world's governments debated and edited it line by line. A conference set for Paris in December 2015 aims to reach an international agreement to require developed countries to reduce greenhouse gas emissions by specific amounts. They must drop to zero by 2100. Signs of hope are small. A similar conference in 2009 in Copenhagen collapsed. Science at the September 21 climate march. In 2011 Benishek voted to strip the EPA of court-approved power to regulate greenhouse gases. His well-publicized cynical and longstanding views on climate change render him a menace, unfit for public service. Northern Michigan voters will some day regret their repeated decisions to return him to office. Why they do so is a mystery I cannot fathom. I hasten to add, on climate Cannon is no better. Many years ago at a social event during the Watergate scandal an acquaintance said this to me in jest about Richard Nixon, "It's not that he's a crook; it's that he's not our crook." Looking back, the igniting felonies of Watergate -- burglary and wiretapping -- were mundane. But torture is not mundane. If you torture someone, US law says it's a 20-year felony. The head of CIA operations considered it so horrific in 2005 that he said public release of tapes depicting it would be "devastating" to the agency. A second great puzzle to me in this campaign was that the torture information I uncovered about Cannon did not inflame the public. I am a great believer in just letting the facts tell the story. Presenting them without elaboration or ridicule allows the viewer to evaluate them and judge for him/herself. The viewer's conclusion is thereby of greater conviction. All the torture facts have been of public record since 2006 except one, Cannon's personal involvement in a specific instance at Guantánamo Bay in early 2004. Methodically I tracked down the details, which culminated in an August 20 email from exonerated detainee Mustafa Ait Idir, now in Sarajevo. Written in rudimentary English, the email confirmed Cannon as the orchestrater of abuse Ait Idir received as he bravely resisted guards' seizure of his pants. The details are here. Importantly, the events happened in the detention context, not the interrogation context from which Cannon has been careful in public statements to try to distance himself. The same is true of several other documented instances involving other detainees, on dates it was likely (though not certain) that Cannon was the base commander. And as to his claim that he has no responsibility for black-site interrogation which occurred at the base during his tour -- about which information came out with the December 2014 release of the torture report of the Senate Intelligence Committee -- it is not so. Rather, as head of detention detainees were under his protection at all times. It was his responsibility to see they were treated with care and respect even during an interrogation. Though the Guantánamo Bay page of this site questions his unsupported claim that the International Committee of the Red Cross gave his operation a clean bill of health (ICRC evaluations are confidential), I have not said he lied about any particular fact. Indeed I gave him a way out, if he would simply answer specific objective questions posed at the end of the page. But he refused to answer, even when I asked him directly, as we were leaving the stage after the forum on October 21. Thus, I first published the page on August 30. In addition to my investigation, the page shows a Vice TV interview with Ait Idir. (Unbeknownst to me at the time, it was recorded about the same date that he responded to my email inquiry.) A complete transcript of his military trial is also linked. The story is also told of how Ait Idir prevailed over Cannon in 2008 in the US Supreme Court, and convinced two other federal judges of his innocence and integrity. In the week after publishing it I contacted two media outlets which I thought would have interest. They didn't respond. I also started telling friends and potential supporters. Starting on September 8 I notified Cannon supporters who I expected would forward it to him. They did. On September 12 I heard back second-hand that one Cannon supporter, former Emmet County Democratic Party Chair Gordy Bourland, discussed the pants incident with him at length. As it was told to me, Cannon did not deny or even address the specifics of the incident. On September 16 I wrote Cannon supporters saying I was about to issue a press release. I invited him to respond to specific questions on the page first, which I promised I would then acknowledge in the press release. He did not respond to the invitation. One feeling I get from Cannon supporters is similar to that of my friend from the Nixon era: It isn't whether he is a torturer; it's whether he is our torturer. The secondary feeling I get is anger for even raising the matter. One emailed me on July 19, saying peremptorily about my congressional run: "Drop out." Another told me as he walked into an October 19 Cannon fund-raiser where I was standing outside distributing literature: "Ellis I don't even want to talk to you." This was a reversal of the Democrats' attitude toward me in 2010. On September 18 I began circulating the press release and contacting reporters and lawyers. This was when I became puzzled. Because the CIA considers torture horrific, devastating, and criminal, I expected the public in Michigan and around the country would feel the same. I expected it especially given that Cannon did not deny or try to explain away the specific facts. Nor did any of his supporters or anyone in the media. Boal said he's not concerned that he may draw votes away from Cannon. He said Cannon oversaw incidents during his time at the Guantánamo Bay detention center that amounted to torture. Cannon said his soldiers did a "phenomenal job" running the jail at Guantánamo Bay. He said all detainees were treated with care and respect and Boal's accusations are "absolutely wrong." "I think he's trying to make political hay out of something that didn't happen," he said. No reporter that I know of has made contact with Ait Idir in Sarajevo, to confirm or not confirm what he says happened. Nor to my knowledge has the US Attorney General. It would take but little time to make the contact and review the details and the ID of Cannon. A translator would probably be needed. His primary languages are Bosnian and Arabic. After the election an activist blogger/author (who I had not contacted) wrote a piece "Torturer on the Ballot" criticizing the corporate media for refusing to cover the issue. Based on the undenied specific facts we know of, it is fortunate that Cannon didn't go to Congress. It would have been a national embarrassment for him to sit in the House, making decisions that affect people around the country and the world. Still, he should be indicted for war crimes. Ait Idir on the other hand should be treated like a hero and invited to come testify to the Senate Intelligence Committee. More to the point, he never attacked Benishek's "baloney" assertion. Instead he favors "expanding production of American oil and natural gas" albeit "responsibly." (McDowell's website said the same in 2012.) But as seen above, any expansion, no matter how "responsible," takes the planet into a black hole. Fossil fuels must be left in the ground. Another puzzle: The Sierra Club and the League of Conservation Voters Action Fund endorsed Cannon, citing his military record and environmental policies. I wrote them on September 8 and 11 respectively providing the details and asking that they reconsider. They didn't. Compared to the statewide Green Party candidates for governor, attorney general, and US senator, I scored the highest, if you count just the 31½ counties of the first congressional district. 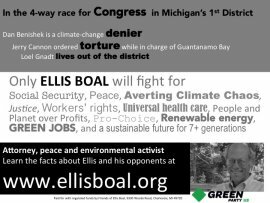 Elsewhere in northern Michigan, longtime Traverse Bay Watershed Green Party organizer Tom Mair got 44% running for Grand Traverse County commissioner, within striking distance of his four-term incumbent Republican opponent's 55%. Mair had called out her recent orchestration of the appointment of the county's full-time parks and recreation director, even though the new director did not meet the county's minimum requirements, and the county board never publicly posted the job opening. A bright spot for the Green Party nationally was Howie Hawkins's 5% finish in the New York governor's race. His showing means the Party will move from the sixth to the fourth spot on the state ballot for the next four years. Like me, Hawkins is adamant about banning fracking. In the past I have commented on negative campaigning in elections. My own protocol has been to link to opponents' websites so that contending viewpoints can be compared, never use sarcasm or raise personal issues, and trust your opponents' good faith even when they are mistaken. But in 2010 I came to question Benishek's good faith when I learned his campaign had issued a press release he knew to be false. Certainly I have spoken negatively about my three opponents in this campaign. But I did link to their sites. I wrote and spoke about their documented records (and in Gnadt's case the lack of a record) in public life. I never used sarcasm. Before starting broad contacts to the media I gave Cannon time after publishing the Guantánamo Bay page on August 30 to provide specific answers to questions. So as to my three opponents' good faith, for the reasons above I have come to believe they do not have it. Frequently I am asked if I am concerned my candidacy could take votes away from Democratic candidates and result in a Republican victory. The year 2012 is an example. Benishek won only by a plurality. McDowell was short by just 1881 votes or .5%. However, the question is better asked of Libertarian Emily Salvette, who got 10,630 votes or 3.1% that year. I got only 4,168 or 1.2%. Also to be considered is that some people may not have voted at all had Salvette or I not been in the race. So the question calls for speculation. Even so it's not implausible that half of my votes might have gone to McDowell and put him over the top had I not run. And McDowell -- even though he advocates expanding US production of oil and natural gas, is anti-choice and pro-official English, and was a patsy for the failed crackpot terrorism-insurer Sovereign Deed -- does not have the horrific torture problems that Cannon has. This leads to my direct answer. The Green Party is not the left wing of the Democratic Party. It has its own principles and structure which are quite different from the DP's. For example we would not nominate someone who is anti-choice. We would not nominate someone involved in torture. The Party's principles are elaborated here and here. Greens have to start somewhere. Eventually we hope to convince the voters to our view and implement our policies. We have a long way to go to fix things. But right now, Greens are the only party that is even trying. Great thanks to Peggy Case, Gary Garrett, Bill Joswiak, Jim Klimaski, Seonghee Lim, Lou Novak, John Porter, Peggy Rahbi, Peter Solenberger, and Bennet Zurofsky for generous and unsolicited campaign donations totaling $655. Thanks also to Linda Cree and Aimée Cree Dunn who organized the event in Marquette and Alexandra Thebert who put us up for a night, Michigan Green Party election coordinator John LaPietra for answering numerous technical questions, Tom Mair who organized two campaign events in Traverse City, Simon Swartzman for helping me think through details of the single-payer issue, Dianne Feeley and David Finkel for political guidance, the Center for Constitutional Rights for publishing the details of Ait Idir's ordeal in 2006, his lawyers Rob Kirsch and Steve Oleskey who answered many questions and provided a conduit to him, and my wife LuAnne who set up the campaign facebook page, oversaw campaign finances, designed the cards and ads, negotiated with the ad publications, and accompanied me to many events. Most deeply I want to appreciate the courage of Mustafa Ait Idir himself for taking a principled stand in a lonely prison cell, knowing the unspeakable consequences he would suffer, and permitting me to re-tell the story these 10 years later. Expenses for the campaign totaled $1074.52, which went for ads in the newspapers, printing of cards, financial fees, and travel and lodging for the trip to Marquette. For 2608 votes it works out to a bit over 41 cents/vote. Some expenses were paid by check from an account for Friends of Ellis Boal at Charlevoix State Bank, and some were paid in kind by LuAnne and myself. In all, we covered the $419.52 difference between expenses and donations. Final reconcilation was done on January 8, 2015, when the CSB account was closed. On September 22 Cannon supporter Bill Brown filed a complaint with the Federal Election Commission against the campaign, alleging a "serious breach" of campaign finance laws by reason of the wording on the site's donation page thought to be incomplete. FEC assigned file # MUR 6877 to the complaint. I was notified by letter of October 8. I responded to the FEC on October 18, with a copy to Brown, noting among other things that the campaign had not reached the FEC's $2600 and $5000 threshold reporting levels for a House candidate, and that in any event I had changed the wording on the page. Brown filed no reply. On June 15 and 21, 2016, the FEC dismissed the complaint, noting that "screenshots of [the] website ... appear to contain a proper disclainer...."